SCEA today officially announced MLB 14: The Show which will debut on the PS4 in March along with PS3 and PS Vita versions. 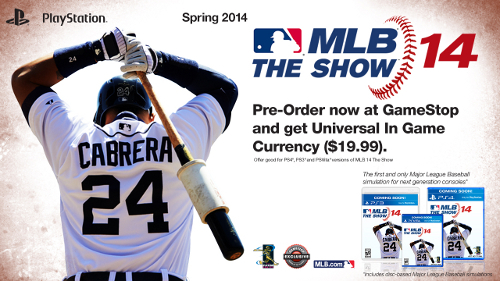 The news was accompanied by the reveal of Miguel Cabrera as cover athlete at the MLB Player’s Choice Awards. He was selected for the honor by the players themselves. Check out the FB album for the first three screenshots. An exclusive pre-order bonus at Gamestop will provide $20 worth of “universal in-game currency” which is probably the last thing consumers want to hear about becoming a bigger part of any sports game. No details yet on what other retailers may be providing as their own incentives. Continue on to check out the official teaser trailer!